Beauty Costs > How Much Do Box Braids Cost? Box braids are not braided to the scalp and move freely. Famous celebrities, such as Beyonce, Brandy and even Solange Knowles, to name a few, are noted to wear box braids with glamor and elegance. This type of hairstyle is great for those who want a low-maintenance hairstyle and can work with anyone who has long enough hair to braid. The average costs for box braids, according to our research, can run anywhere from as little as $85 to $250. The cost will depend on the hair length, age, the amount needed, the size of the braids and the stylist/salon performing the braid. Box braids to your waist will often the most expensive process, costing anywhere from $200 to $300, while a mid-waist will be $85 to $150. Kids, who are younger than 10, will often cost 20 percent less than an adult. If you don’t have enough hair, then your stylist may need to take hair pieces and weave it in, increasing the price. The amount of hair you need will depend on the length and style desired, but most of the time, you will need six to 10 packs, with a pack retailing for $2 to $4 per pack. The price differs between kids and adults. Emanisalon.com, for example, offers a minimum price of $150 for adult box braids (either Invisible Braids or Corn Rows) but is less than $100 for younger kids. On LipstickAlley.com, forum members talked about what they had paid for box braids. Most paid anywhere from as little as $65 to more than $250. Those who brought in the hair were often able to save more than those who didn’t. As mentioned, if you have a long hair you can go to a hair salon and have it braided immediately. If not, then you will need hair extensions. This cost of these extensions will depend on if you use the stylist or bring in your own hair. Basically, with the estimates mentioned above, this will include the braiding of your hair. The inclusions, such as hair treatments that need to be applied in order to make the hair perfect for braiding, may be an additional cost depending on the salon. Styles can vary when it comes to box braiding, and common “styles” you may see online can include jumbo, medium, small, cornrows, freetress, crochet, bob and twists. It usually takes anywhere from two to three hours, on average to box braid, again, depending on the factors mentioned prior. Before a stylist braids, they will more than likely want to shampoo and condition your hair. This process, depending on your stylist, may tie it into the estimate or charge extra. Most hair stylists expect a tip. 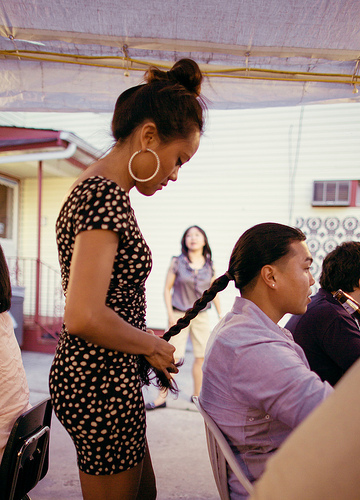 Because box braiding a person’s hair can take so long, a generous tip is a good idea. Plan about 20 percent or more. For the proper care, after the procedure is done, hair stylists will suggest a certain oil that needs to be applied. Some may throw this in with the price you pay, while others may charge separately for it. These basic oils simply keep the hair from getting tangled and from falling out, but there are more expensive oils that claim to revitalize the hair and improve it. Removing your box braids, if you decide to use the stylist again, may charge anywhere from $50 to $70, depending on the amount/size. The costs can be high due to the removal process, which involves using a comb to detangle the real hair from the pieces. Also, depending on the how long you keep your braids in, they will need to be redone every few weeks or months. If you decide to have box braids, you must consider the fact that braids must be worn for at least two months. If you decide to take them out before this time, then there’s a good chance you will lose a lot of hair. Also, you should be careful that the stylist does not braid your hair too tightly, especially near the edges. As we all know, hair loss can occur if the hair is pulled too tightly. Extremely tight braids can also be uncomfortable and even cause headaches. Experts warn you must wash your braids once a week when you take them out to prevent your hair from becoming tangled or dirty. As for daily treatment, putting oil on the hair usually does the trick. Talk with a few salons to see what they can do and how much they charge. While you don’t want to focus solely on the price, it doesn’t hurt to look at references and past pictures of work they have done. If you can do it on your own or with the help of a friend, then do so. That will save you a great deal of money. However, just make sure that you do it right so it does not end up being a waste of time. If you do need hair extensions, consider bringing in your own hair to cut down the costs. Hate it it ruined my life!!!!!!!!!!!! Asked for boxed braided wrapped with loose curl. Provided picture to of what I wanted my hair to look like. Got something totally different. Hated everything about it. Cornrows to the front and 5 rows of singles in the back.